Hull City maintained their one-point lead at the top of the Championship with a narrow victory at Ipswich Town. Tigers striker Mohamed Diame got on the end of Andrew Robertson's through-ball for the only goal of the game and his sixth of the season. Daryl Murphy went closest for the hosts with a first-half half-volley against the post while Jake Livermore also struck the woodwork for the visitors. Ipswich have now failed to beat Hull in their past eight league meetings. Defeat also saw the Tractor Boys' run of 16 consecutive wins on a Tuesday night, stretching back to April 2013, come to an end. Hull boss Steve Bruce made nine changes to the side which held Arsenal to a goalless draw in the FA Cup fifth round on Saturday. One of those changes, Robert Snodgrass, forced Bartosz Bialkowski to tip his early free-kick over the crossbar. Ipswich grew in to the first half and Murphy hit the post from Ben Pringle's free-kick and Christophe Berra had a header on target deflected wide. But, moments after the break, Mick McCarthy's side failed to keep a clean sheet for a ninth successive game as Diame broke the deadlock. Robertson's surging run from left-back culminated in a fine pass for Diame to dink it over the on-rushing Bialkowski. "We were beaten by a better team on the night. We actually could have taken the lead in the first half but that is the fine margins of the Championship. "The talk in the dressing room at half-time was not to concede an early goal but that is what we did - although it was a fantastic goal. "They could have scored more but the Championship is so bonkers that we almost notched in the last few minutes." "It was a case of job done. We were up against a really committed team in the first half, which mirrored their manager in terms of effort and endeavour. "But we had that bit of class in the second half and we could have actually put the game to bed but we didn't take our opportunities. "When you are top of the league, you know teams are going to have a go at you and you have to earn the right to play. Mo Diame was man of the match for me, it was a wonderful goal." Match ends, Ipswich Town 0, Hull City 1. Second Half ends, Ipswich Town 0, Hull City 1. Attempt missed. Tommy Smith (Ipswich Town) header from the centre of the box misses to the right. Assisted by Freddie Sears with a cross following a corner. Corner, Ipswich Town. Conceded by Allan McGregor. Attempt missed. Freddie Sears (Ipswich Town) left footed shot from the centre of the box is close, but misses to the left. Assisted by Luke Varney with a headed pass. Chuba Akpom (Hull City) wins a free kick on the left wing. Attempt missed. Daryl Murphy (Ipswich Town) header from the centre of the box misses to the left. Assisted by Luke Chambers with a cross. Attempt blocked. Robert Snodgrass (Hull City) left footed shot from outside the box is blocked. Assisted by David Meyler. Substitution, Hull City. Nick Powell replaces Mohamed Diamé. Attempt missed. Brett Pitman (Ipswich Town) right footed shot from outside the box misses to the left from a direct free kick. Kevin Bru (Ipswich Town) wins a free kick in the attacking half. Substitution, Ipswich Town. Luke Varney replaces Ben Pringle. Hand ball by Chuba Akpom (Hull City). Substitution, Hull City. Chuba Akpom replaces Abel Hernández. Foul by Ben Pringle (Ipswich Town). Attempt missed. Sam Clucas (Hull City) header from the centre of the box misses to the right. Assisted by Robert Snodgrass with a cross following a corner. Corner, Hull City. Conceded by Bartosz Bialkowski. Christophe Berra (Ipswich Town) wins a free kick in the attacking half. Corner, Hull City. Conceded by Jonas Knudsen. Jake Livermore (Hull City) hits the left post with a left footed shot from the left side of the six yard box. Attempt saved. Sam Clucas (Hull City) left footed shot from the left side of the box is saved in the bottom left corner. Assisted by Jake Livermore. Attempt blocked. David Meyler (Hull City) right footed shot from the centre of the box is blocked. Assisted by Mohamed Diamé. Attempt missed. Mohamed Diamé (Hull City) left footed shot from outside the box is too high. Assisted by Robert Snodgrass. Goal! Ipswich Town 0, Hull City 1. 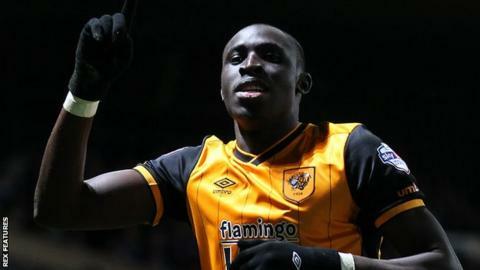 Mohamed Diamé (Hull City) right footed shot from the centre of the box to the centre of the goal. Assisted by Andrew Robertson with a through ball. Attempt saved. David Meyler (Hull City) right footed shot from outside the box is saved in the bottom left corner. Assisted by Sam Clucas. Attempt blocked. Abel Hernández (Hull City) left footed shot from the centre of the box is blocked. Assisted by Robert Snodgrass.